Journal entry by Ben, Cuba Global Volunteer and University of Iowa Student, written during his volunteer program in Ciego de Ávila, Cuba. It’s the number of full days that we’ve been on the island, and the number of days that I have gotten to share with my wonderful teammates. We’re a motley (see: Rene) crew, but I have really enjoyed getting to know everyone. I’ve been pushed out of my usual bubble and I couldn’t be more grateful. Now I know how to knit, how to varnish a door the American way, and what Shaquille O’Neal does in his spare time. The number of students that I’ve gotten to have “relaxed conversations” with so far through my volunteer work in Cuba. We’ve found these students to be brilliant, dedicated, and eager. They are the face of a modernizing Cuba, though they will have innumerable challenges in the future. These young people are filled with hopes and ambitions to change the world, and if the rest of their generation is anything like the students I have met, I have no doubt that they will positively transform Cuba in years to come. The average number of jokes that (my teammate) Rene tells when the lights go out at night. The number of jokes that I laugh at is a different number, but that’s not important. The number of episodes of the television show Game of Thrones that I have watched while here in Cuba. This was made possible after a night at the community center with a student named Frandy, who also loved the TV show. After hearing that I needed to catch up on some episodes, he went home that night and burned me a copy onto a disk, which he gave me the next day. It was a small gesture for Frandy but it really had an impact on me. We were born into different circumstances, but apart from that we’re very much the same person. The minimum amount of showers that I have taken daily. Seriously people, I haven’t stopped sweating once in the last week. Cuba is wonderful, but I will not miss wringing out my shirt after returning from the Wi-Fi park each day. And finally, one. Over the course of my volunteer work in Cuba, I feel that we have really come together as one team, both within our American Global Volunteers group and with the Cubans. There is a lot that sets us apart from one another, but much much more that unites us. 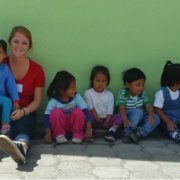 Interested in opportunities to do volunteer work in Cuba? Visit Global Volunteers’ Volunteer in Cuba webpage to learn more about the service opportunities we offer in Havana, Ciego de Ávila, or Sancti Spíritus. Or, chat online with one of our Volunteer Coordinators. We’re ready to assist you with project descriptions, travel questions, registration guidance and other program details.